Anticipating a long drive this weekend, I hunted around Audible.com for something new to listen to. 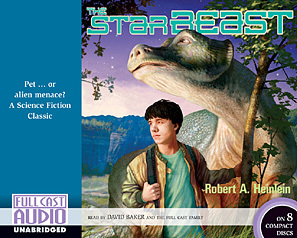 I happened upon this version of one of Robert A. Heinlein’s “juvenile” novels, “The Star Beast.” It’s from a company called Full Cast Audio. 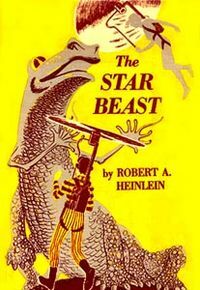 The book was published in 1954 and was one of Heinlein’s best-loved “juvenile” novels. I read it when I was in grade school, like many young science-fiction fans of my generation, even though many of the concepts were over my head. The book holds up well, even to today. Sure, some of the language is kind of dated, and some of the concepts are kind of quaint. On the other hand, children can divorce their parents, and one of the main characters has done exactly that. A large portion of the book has to do with behind-the-scenes goings-on at the Stellar Federation’s Department of Spatial Affairs. These scenes, and the character of Mr. Kiku, are absolutely delightful, and are made moreso by the audiobook rendering. Mr. Kiku is the Undersecretary, the “power behind the throne,” a career bureaucrat from Kenya. He has that Oxford/Kenyan lilt to his voice and the actor, Rodney Hudson, does a brilliant job making him an endearing figure and a complex character. While there is enough in the book about the gigantic ET Lummox and his friend John Thomas Stewart to capture and hold the attention of young people, there is a lot more for adults here. I found myself driving along I-65 to and from Indianapolis in the rain with a smile on my face. The gentleness of language is a nice change from today’s novels, and Heinlein’s deft touch at showing humanity’s foibles for what they are is at its best here. It’s a delightful book, delightfully rendered by the audiobook cast. I recommend it to science fiction fans without reservation! You are currently browsing the The Old Gray Cat blog archives for the day Sunday, April 17th, 2011.